A first-rate B2B podcast will give marketers regular access to some of the industry’s leading influencers – and something worthwhile to do on the tube. So every item on this list comes with two promises: education and entertainment. Here’s our guide to the top five B2B marketing podcasts that will make you better at your job. Jason's trademark rock ‘n’ roll flavour sets a vigorous pace for discussion, covering everything from storytelling in B2B to effective time management. Each episode gives you opportunity to listen to him riff ideas and anecdotes with industry heavy-weights – our recent favourite covers swearing, Bigfoot and social c-suites with Jon Watkins, head of content at Seven. Keen to avoid the well-worn 'two-blokes-chew-the-fat' formula? Well, you could do far worse than Uberflip’s 'Flip the Switch' series. One of the longest running on this list, it’s both convivial and down to business with snappy intros followed by straight-up conversation from bright marketing minds. Tune in to new episodes every Tuesday to hear talk of tools, tactics and processes behind driving growth and optimising campaigns. Adding a human element to your brand through video is a good starting point. The csuite podcast is a gloriously mixed bag. Not just with regards to topic ranging from Brexit ramifications to B2B demand generation – but also in terms of its senior executive guests. Recent highlights include LBC’s Ian Collins and the Godfather of content marketing, Joe Pulizzi. Recorded in-studio and on location in places like Toronto and Cannes Lions, it sets out to explore ‘the latest trends and issues in social media, digital and innovation in communications’ and does so with panache. Expect unadulterated marketing discussion from this long-standing series. In 30-minute weekly podcasts, MarketingProfs brings together talent from a huge variety of industries with the sole purpose of delivering its subscribers first-person advice to enhance their day job performance. 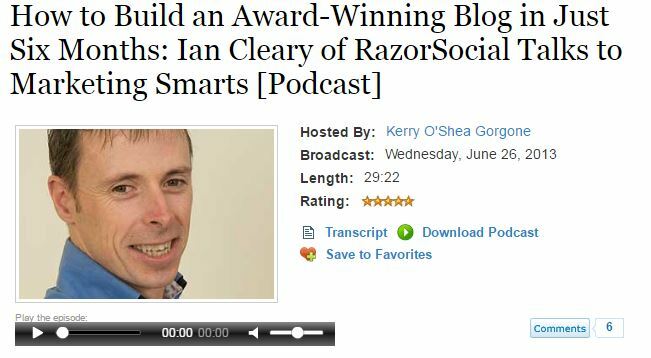 If you're after interview-led best practice from top marketers, How to build an award-winning blog in just six months with Ian Cleary of RazorSocial is a good starting point. In 2006, Mitch inaugurated Six Pixels of Separation as a means of sharing innovation insights on digital marketing and business transformation. Often joined by expert guests, he provides digital and marketing hacks with weekly insight and provocations from his always-on, always-connected world. B2B Marketing have expanded into the audio area. Hosted by broadcast trained journalist Molly Raycraft and B2B marketer Adam Harper, the duo explore best practice with a variety of succinct interviews from senior marketers. The first episode launched in February 2019 featuring Simon Rusling of Barnett Waddingham, Brian Macreadie of Addleshaw Goddard, and Gemma Davies of ServiceNow. While the podcast is still in its infancy, we're certain with your feedback it will get even better fortnight by fortnight. You can send your suggestions to Molly or Adam on twitter @molly_b2b or @Adam_Harper_B2B. Take a listen to the first episode below!